Many recent articles have highlighted the shortage of women and underrepresented minorities in the tech industry, as well as problems associated with the “Bro Culture” of Silicon Valley. However, few articles have offered suggestions other than hiring practices as a way to increase diversity. Just how dire is this problem, and what can be done about it, other than suggesting a cultural change initiated by teams that are largely comprised of the exact same backgrounds? 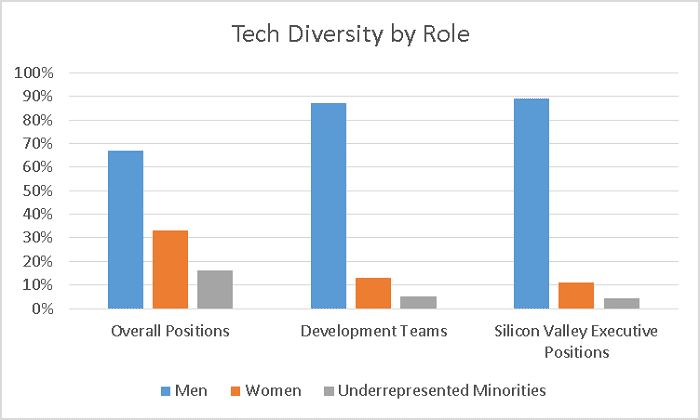 Approximately one third of the tech industry is female, and approximately one sixth is underrepresented minorities (Hispanic or African American). Management is approximately five sixths Caucasian. Large tech companies such as Google or Apple report even less diversity among their workforces, and within tech-specific positions, the industry is 24% women and 5% underrepresented minorities. On development teams, women make up as few as 13% of roles, and women in technical positions are twice as likely to leave a position as men. These statistics suggest that women and underrepresented minorities are in jobs not related to technical development or leadership in tech companies. Companies can benefit in many ways from increased diversity. A recent report from McKinsey suggests that the top quarter of companies with respect to racial and ethnic diversity enjoy a 35% boost in likelihood of exceeding industry median returns compared to baseline rates. Having a female in an executive position boosted return rates for the Standard & Poor 1500 companies’ revenue by $42 million. This suggests an opportunity for boosted revenue through hiring a diverse tech team and a diverse executive team. In addition, the experiences women and minorities bring to tech teams can aid in design and cover potential blind spots in user experience and product development. However, addressing this issue is more complex than simply changing hiring practices. Women and underrepresented minorities make up disproportionately small fraction of the educational pipeline associated with tech positions; the number of women graduating with computer science degrees continues to fall (from 37% in 1984 to 18% in 2014). Given the ubiquity and ease of online training programs and MOOCs these days, it would be easy to assume that those opportunities bridge the gap. However, data science programs/bootcamps lag in female participation (35% of participants are women) and in underrepresented minority participation (4% African-American and 8% Hispanic), as well. With low diversity in academic programs and industry bootcamps, the tech position figures are unlikely that the trend will change in the near future. Even reductions in discrimination may not help if young students do not see anyone who looks like them or comes from the same socioeconomic background within a classroom. Educators, bootcamp directors, and the tech industry itself can address these disparities, though, and several initiatives are likely to boost numbers in the coming years. Many scholarships exist for women in tech bootcamps (https://www.switchup.org/blog/women-in-tech-a-comprehensive-scholarship-guide) and academic programs (https://www.scholarshipsforwomen.net/engineering/), as well as African-American and Hispanic students (http://www.nacme.org/). The US has also promised $200 million of STEM education funding to women and minorities in the coming years. This can help with affordability issues, as well as serve as an incentive for women and underrepresented minorities to try a tech-related major or bootcamp. In addition, small business grants are available for companies with women or underrepresented minorities in founder or leadership positions (https://startupnation.com/start-your-business/small-business-grants-women-minorities/, https://www.fundera.com/blog/where-to-find-small-business-grants-for-women, https://www.nerdwallet.com/blog/small-business/small-business-grants-minorities/, https://www.federalgrantswire.com/minority-federal-government-grants.html#.W47QKYeouK8, https://www.allamericangrantguide.com/minority-business-grants.php), helping to increase diversity at the higher levels of start-ups. Before starting my side consulting LLC, I was not aware of the types of funding available to start a small business, and it is possible that women and underrepresented minorities who have thought of starting a business are unaware of the funding available to do so. Industry conferences offer another opportunity to encourage women and minorities to pursue tech positions and career growth. Stanford’s Women in Data Science (WiDS) conference surpassed 100,000 attendees in hundreds of cities this past March, and this has allowed women to present their work to other women and to the men who attend the conference. Creating a conference similar to WiDS that highlights the tech-based accomplishments and work of African-Americans and Hispanics or those who came from low-income families might create similar visibility within the larger community that portrays tech as a viable career choice. My own path into the tech industry involved three professors—one in an introductory calculus course and two during graduate school—who were successful women in mathematics, and my first roles within the industry were for companies with involved female leaders. Without an opportunity to learn from these women, I’m not sure I would have seen leadership or technical roles as a good fit for me. Creating visibility of women and minorities in technical education/programs, particularly early on, and making those opportunities financially viable through scholarship and grant programs can increase diversity at all stages of a technical career. Visibility of role models and resources may be more effective at increasing tech diversity (and STEM diversity in general) than hiring guidelines and other equality measures. Campaigns like the UK-based WISE initiative, which focuses on helping and encouraging young women to pursue STEM careers after age 16, and Miami’s Women in Biomedical Science Initiative may be one route to achieving this. More conferences like WiDS can also aid in the visibility effort. With visible leadership by women and minorities in the field, wider knowledge of opportunities and funding available, and programs that connect a new generation of potential tech workers with those further along in their careers.